This medical office sublease is designed for a scenario where an individual doctor or group of doctors subleases space from a medical management company. The management company also provides management services for the physicians (account collections, the furnishing of personnel, etc.) pursuant to a separate management agreement (not included). The rent is set on an annual basis by the landlord (the management company). The sublease is extremely pro-landlord in tone. 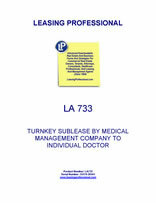 This Lease (“Lease”) is made as of _________________, by and between MEDICAL MANAGEMENT LANDLORD, INC., a __________________ corporation (“Landlord”), and AGREEABLE PHYSICIAN, INC., a _________________ corporation (“Tenant”). 1. PREMISES. The Landlord hereby leases to Tenant and Tenant hires the Premises from Landlord. Together with the Premises, Landlord hereby leases to Tenant for the term hereof all fixtures, furnishings and furniture appertaining thereto (but subject to any and all liens, financing statements, conditional sales contracts, etc., and to the terms of any equipment leases pertaining thereto). Further, Landlord agrees to provide to the Tenant the management services, personnel, equipment and supplies (hereinafter called the "Management Services" described in the Management Agreement of even date herewith. 2. TERM. The term of this Lease shall be for a period to run concurrent with the term of that certain Management Agreement dated of even date herewith by and among Landlord, and Tenant, but in no event for a period of less than one (1) year. a. From and as of the date hereof and until one year from the date hereof (the "Anniversary Date"), the sum of ____________ dollars ($__________) per annum. b. The parties hereto shall mutually agree upon a revised rent on or before two months prior to the Anniversary Date of each Lease year (the "Revision Date"). If the parties fail to reach an agreement with regard to the revised rent before the Revision Date of any Lease year, then the Landlord may, in its sole discretion, determine the revised rent by giving written notice thereof to the Tenant on or before ten days prior to the Anniversary Date of the Lease year. In the event that the Tenant is dissatisfied with such revised rent, the Tenant's sole recourse shall be to notify the Landlord, within ten days after receipt of notice of the revised rent, of the Tenant's intention to terminate this Lease as of the sixtieth (60th) day from the date the notice is sent. Failure to so notify the Landlord of its termination of this Lease shall be deemed to be an acceptance by the Tenant of the revised rent, and the Tenant shall thereupon be obligated to make timely payments of the revised rent to the Landlord. c. The rent shall be payable in monthly installments. Payment of the rent shall be made by the Landlord, in its capacity as manager of the Tenant's business pursuant to the Management Agreement, by drawing a check or wire transfer or other bank transfer payable to the Landlord on the Tenant's account maintained by the Management Company pursuant to the Management Agreement. d. The Landlord and Tenant agree that upon termination or expiration of this Lease for any reason, the Landlord, as Manager, will continue to collect as agent of the Tenant, (pursuant to the Management Agreement) all of the Tenant's then outstanding accounts receivable for professional and ancillary services rendered and will continue to be paid from receipts therefrom any amounts outstanding from the Tenant pursuant to this Lease and/or the Management Agreement until all such amounts then or subsequently due the Landlord shall have been repaid in full. a. This Lease shall terminate automatically in the event that any ground lease, or other lease senior to this Lease (“underlying lease”) by which Landlord has an interest in the Premises is canceled, terminated or otherwise expires. Landlord shall give written notice to Tenant of the cancellation, termination or expiration of any underlying lease and shall specify therein the date of termination of this Lease, which shall be the same as the date of termination of said underlying lease. b. This Lease shall terminate automatically upon the termination of the Management Agreement for any reason whatsoever. c. This Lease shall terminate automatically at such time as the Tenant does not qualify for any reason as a professional corporation, including but not limited to the death or disqualification to practice medicine of every shareholder. For these and all other purposes, the determination of a physician's qualification to practice medicine shall be made by the Tenant and/or by the applicable governmental and professional regulatory agencies, and the Landlord shall in no way make or contribute to such a determination. (7) if the notice provided for in Paragraph above shall have been given, and the term shall expire as aforesaid; then and in such event Landlord may without notice, re-enter the demised Premises either by force or otherwise, and dispossess Tenant by summary proceedings or otherwise, and the legal representative of Tenant or other occupant of demised Premises and remove their effects and hold the Premises as if this Lease had not been made, and Tenant hereby waives the service of notice of intention to re-enter or to institute legal proceedings to that end. If Tenant shall make default hereunder prior to the date fixed as the commencement of any renewal or extension of this Lease, Landlord may cancel and terminate such renewal or extension agreement by written notice. No failure or delay on the part of any party to exercise its right of termination hereunder for any one or more causes shall be considered to prejudice said party's right of termination for such or any other subsequent cause. Termination or cancellation of this Lease for any reason whatsoever shall in no way release any party from any payments, obligations or liabilities arising prior to termination or arising from acts or failures to act on or before the date of termination or otherwise due after termination pursuant to the terms of either this Lease or the Management Agreement. Furthermore, no termination of this Lease or of the Management Agreement shall in any way affect the survival; of any right, duty, or obligation which is expressly stated elsewhere in this Lease or in the Management Agreement to survive such termination.